History is full of societies living with terrible things that, until a brave visionary draws attention to them, are thought to be acceptable. Martin Luther in the 1500s. Lewis Hine in the early 1900s. And now, Thomas Baekdal on Twitter over the weekend. We discovered that our society was the latest on that tragic list when Baekdal tweeted out a side-by-side comparison of the Apple and Google hamburger emojis. Take a hard look at Google's cheese placement (and a hard look at yourself after). As you can see but probably wish you hadn't, the cheese on this burger is below the meat. Imagine how many employees had eyes on this before it was approved and sent out into the world. It's an oversight that's frankly negligent. Naturally, Twitter freaked out. Oaths were made. Marriages might have dissolved. Finally, Google CEO Sundar Pichai weighed in. He claimed that they'd "drop everything to fix this." In other words, he did the brave thing. That clarification at the end ("if folks can agree on the correct way to do this") is important, however. It's up for debate as to whether the internet has ever agreed on anything, but this issue is even more nuanced than it appears. Take a look at that Apple hamburger again. The lettuce is below the bun. As Americans, it always seemed that, even in a divided country, we could agree that the proper order of toppings on a burger is as follows: bun, lettuce, tomato, cheese, patty, bun. 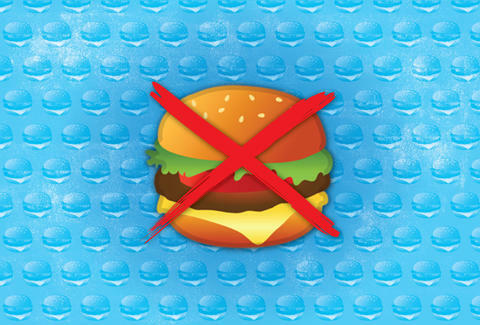 We can't live under that delusion any longer, and every time someone sends one of these so-called hamburger emojis, and every day these emojis stay on our phones, we reinforce that state of affairs. All we can hope is that they act soon. Over at Emojipedia there's a full glossary of the hamburger emojis currently in circulation (welcome to the future). Take a close look: History will be our judge. James Chrisman is a News Writer at Thrillist who can't wait for Google to drop everything to fix him. Send news tips to news@thrillist.com and follow him on Twitter @james_chrisman2.